The stethoscope: What’s my doctor really listening for? Your nagging cough and constant sneezing has sent you to your primary care doctor. Before the doctor looks in your eyes, ears and nose, he takes the stethoscope from around his neck and places it in his ears. He uses his handy device to listen to what your body is telling him that you can’t. While most patients know that the stethoscope is used to listen to the heart and lungs, they have no idea the back story of this important tool and what it can be used to detect. Scott & White cardiologist Bao H. Le, DO, explains how the stethoscope has evolved over time and why doctors can’t live without it. 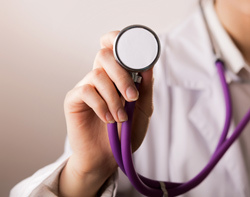 The stethoscope is a device that helps physicians or healthcare providers listen to the internal organs, such as lungs, heart and bowel sounds, and it is also used to check blood pressure. It helps to amplify the internal sounds. How did the stethoscope come about? The device began as just a simple tube, but over the years, it has evolved greatly. Today, there are even battery-powered stethoscopes that help to amplify the sounds your body is making. Why is it such an important tool? A narrow valve, possibly due to aortic stenosis. If the patient has this condition, the doctor will be able to hear the murmur and tell what kind of valve is in trouble and evaluate the severity of the problem. Valve leakage. Doctors can hear the tell-tale sounds of a leaky valve, pinpoint which valve is leaking and the amount of blood leaking. Arrythmias. Physicians can hear if the patient has a normal heart rhythm or if the patient has an abnormal rhythm, called an arrhythmia, like atrial fibrillation. What are the different parts of the stethoscope and what do they do? The three most important parts of the stethoscope are the headset, the diaphragm and the chestpiece. The headset is what allows the doctor to hear what is coming through the other parts of the stethoscope. The chestpiece is the piece of the stethoscope that is placed on the patient’s skin. And the diaphragm is the device inside the chestpiece that allows the doctor to hear different frequency sounds. So, the next time your doctor puts that cold metal chestpiece on your back, you’ll know why he or she is using this important medical tool and what they might be listening for.